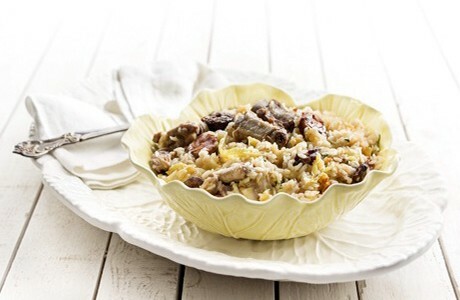 This tasty combination of pork, paired with fresh shredded cabbage and rice creates a hearty, filling rice dish. The smoky flavours of the chorizo and ribs give this recipe a rich depth of flavours. Heat some olive oil in a saucepan; add the onion and bay leaf. Cook over a low heat for about 4 minutes or until onion is translucent. Add the cabbage and cook for about 4 minutes or until the cabbage is wilted. Add the pork ribs, turn up the heat and stir the ribs and onion well. Cook for 4 minutes or until the ribs have browned. Slice the sausages and add them; let them sear for 2 minutes. Finally, add the rice. Stir the meat well and add 1 litre of water. Season with salt to taste. Place the sausage on top and cook for 12 to 15 minutes. If you like, add the coriander at the end of cooking. Remove the sausage and cut into slices. Serve immediately with pudding (sausage) separate, or undone in the middle of the rice.